I'm still not a big fan of tempeh, but of course I'm always certain that a new recipe will change my mind. 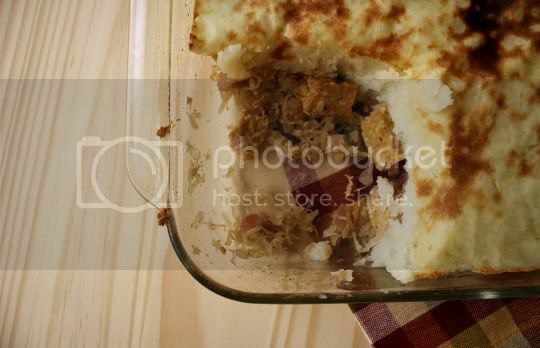 Why I thought this French/German version of a shepherd's pie would, well...I'm not entirely sure. It not only contains the bitter and not-quite-right tempeh, but also sauerkraut - something else that doesn't have me entirely convinced. It's a relatively simple recipe containing only five ingredients; hmmm, maybe that's what seemed appealing. Red onions, sauerkraut, and tempeh are sauteed, then seasoned with pepper. I added a lot of pepper because I was trying to mask the taste that I wasn't looking forward to trying. This mixture is then put in a casserole dish (an 8x8" is about the perfect size) and topped with mashed potatoes. That's it, just potatoes. There's no butter or cream or seasoning added; just enough of the potato-cooking water to make them smooth and creamy. Olive oil is brushed on top before baking for about 30 minutes. Finally, it's broiled for a nice pretty brown crust. I was hesitant at first bite. I was expecting the strange tempeh flavor, possibly even intensified due to a lack of seasoning and ingredients. 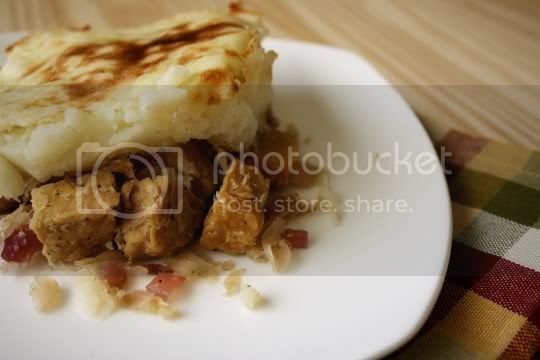 But strangely, I didn't taste the tempeh; I tasted the bland potatoes, which had formed a strange rubbery skin on top. Another mouthful, and I finally tasted the tempeh, but the weirdness was gone. Instead, it's replaced by the tangy sauerkraut flavor, which seems to mellow during cooking. I guess that's because the tempeh picks up the flavor. The kraut and onions are very tasty with all of the pepper, but this dish is just all wrong. A strange bitterness and overall unappetizing aura abounds here...if you're a fan of tempeh and sauerkraut, maybe you'll like this recipe. It has the potential to be good, but there are too many flaws. Remind me to never visit this region of the world for any culinary adventures. Make again? Um no...this ended up being a total waste (of time and money). Hahaha I have never read such a lackluster review of a recipe and still thought about making it. 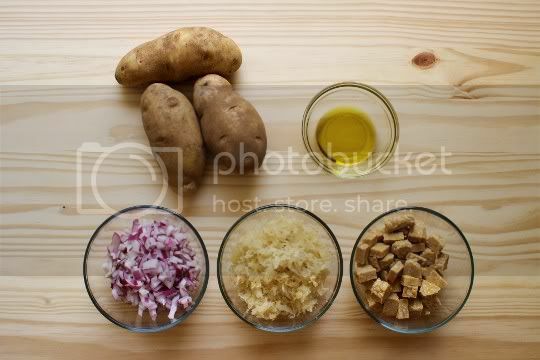 I'm from Germany near Alsace and I love tempeh, sauerkraut, and potatoes. So I would probably love it! Actually there's a German recipe I ate pre-vegan with mashed potatoes, sauerkraut, and bacon. I bet you could make it with tempeh bacon. I should try that. Ha! Well please let me know how your version ends up!